Since May 1, anglers participating in the pikeminnow sport-reward fishery program, have caught thousands of predatory pikeminnow from the Columbia and Snake rivers and as a result saved migrating juvenile salmon and steelhead that are protected under the Endangered Species Act. So far this season, 560 fishermen signed up to compete in the program with the top angler earning more than $36,000 in about three months. The second highest pikeminnow fisherman has been paid a little less than $30,000 with two months still remaining in the season. When the season began, state fish and wildlife workers tagged and released about 1,000 northern pikeminnow into the rivers. Each is worth $500; so far about 100 of those fish have been caught. "Serious and casual anglers have plenty of time to help save salmon and steelhead and pick up a few bucks in the process," said Eric Winther of the Washington Department of Fish and Wildlife. "Removing these predators that eat many juvenile salmon and steelhead as they migrate downriver will help many more juveniles make their trek to the ocean safely." The program pays registered anglers $4 to $8 per fish, nine inches or longer. The more fish an angler catches, the more each pikeminnow they hook is worth. Last year the top fisherman in the program earned more than $80,000 in just five-months of fishing. Northern pikeminnow are voracious eaters, consuming millions of young salmon and steelhead each year. Research shows reducing pikeminnow numbers helps to increase salmon and steelhead populations. Since 1990, anglers paid through the program have removed nearly four million pikeminnow from the Columbia and Snake rivers, reducing predation on young salmon and steelhead by 40 percent. So far this year anglers have brought in 88,999 fish. 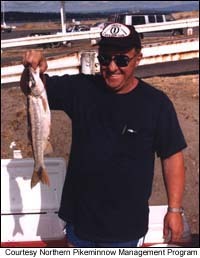 The 2011 season for the pikeminnow sport-reward fishery ends Sept. 30, so there is still time to register and fish. The program is administered by the Pacific States Marine Fisheries Commission and is funded by the Bonneville Power Administration.